Raman spectra from the diamond/c-BN single crystal films. Image: NC State. 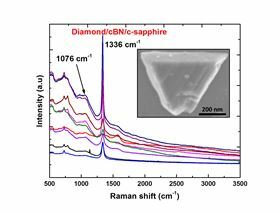 Materials researchers at North Carolina State University have developed a new technique for depositing diamond on the surface of cubic boron nitride (c-BN), integrating the two materials into a single crystalline structure. "This could be used to create high-power devices, such as the solid state transformers needed to create the next generation 'smart' power grid," says Jay Narayan, professor of materials science and engineering at NC State and lead author of a paper in the Journal of Applied Physics describing the research. "It could also be used to create cutting tools, high-speed machining and deep sea drilling equipment," Narayan adds. "Diamond is hard, but it tends to oxidize, transforming into graphite – which is softer. A coating of c-BN would prevent oxidation. Diamond also interacts with iron, making it difficult to use with steel tools. Again, c-BN would address the problem." As its name suggests, c-BN is a form of boron nitride with a cubic crystalline structure. It has similar properties to diamond, but holds several advantages: c-BN has a higher bandgap, which is attractive for use in high-power devices; c-BN can be ‘doped’ to give it positively- and negatively-charged layers, which means it could be used to make transistors; and it forms a stable oxide layer on its surface when exposed to oxygen, making it stable at high temperatures. Earlier this year, Narayan unveiled a faster, less expensive technique for producing c-BN. To create the epitaxial, or single crystal, diamond/c-BN structures, the researchers begin by synthesizing a substrate of c-BN, which is done using the new technique Narayan published earlier this year. They then use a process called pulse-laser deposition, performed at 500°C and an optimized atmospheric pressure, to deposit diamond on the surface of the c-BN. The pulse-laser technique allows them to control the thickness of the diamond layer. "This is all done in a single chamber, making the process more energy- and time-efficient," Narayan says. "You use only solid state carbon and BN, and it's more environmentally benign than conventional techniques." The researchers were also able to deposit diamond on the c-BN using a conventional chemical vapor deposition technique, which utilizes methane gas, hydrogen gas and a tungsten filament at 900°C. "The chemical vapor deposition approach works, but our pulsed laser deposition approach works much better, doesn't involve toxic gases, and can be done at much lower temperatures," Narayan says. Narayan has co-founded a company, Q-Carbon, which has licensed the technique and is now working to commercialize it for multiple applications. By exposing the ceramic silicon nitride to high temperatures and pressures, scientists have managed to make it transparent.